It looks like stone. It feels like stone. It's even made from stone. But it is not stone. It's Cultured Stone – and is accepted worldwide by builders and architects alike. Cultured Stone is manufactured stone that is designed to be lighter and easier to install than natural stone. Molds are taken from select natural stone, using a process that captures even the finest detail. And just like real stone, Cultured Stone's color is blended throughout the entire product. Cultured Stone also doesn't require any additional footings, foundations, or wall ties, saving you time and money. 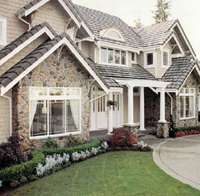 We carry a wide variety of Cultured Stone including Cobblefield, River Rock, Stream Stone, San Francisco Cobblestone, Dressed Fieldstone and Southern Ledgestone, as well as a host of other styles. Call your local Willamette Graystone branch for availability in your area. For more information on Cultured Stone products, download the Spring 2016 Cultured Stone Product Guide as well as the KBI Product Catalog.